Limited to 10 units, priced at $800,000 a piece. German carmakers take the Frankfurt Motor Show very seriously. It only comes around every two years, so it’s important for them to make a big impression. Brabus is arguably the best-known Teutonic tuning house and has arrived at the show with a feast of outrageous automobiles. Chief among them is the "world's most powerful twelve-cylinder off-road vehicle,” dubbed the Brabus 900 “One of Ten." The offroader was recently unveiled online but now we've seen it in the metal we had to show it again. 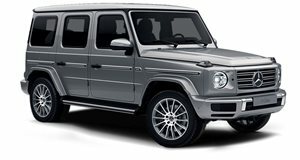 Using the already-extreme AMG G65 as a base, the off-roader has been fettled to churn out 888 horsepower and 1,106 lb-ft of torque (electronically limited to 885 lb-ft). As the name suggests, its limited to only 10 examples. The Brabus 900 takes just 3.9 seconds to sprint to 60 mph, while top speed has been upped from 143 mph to a limited 168 mph. 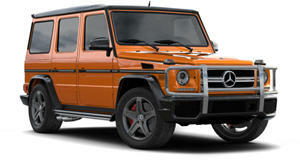 As you can see, the G65-based beast features a carbon-fiber wide body kit that adds 12 cm to the off-roader’s girth. All chrome parts have been painted black for added menace, while the door mirrors get naked carbon covers. Suitably monstrous 23-inch alloys come wrapped in Yokohama rubber and house the largest braking system ever designed for an SUV. Inside, individual seats replace the G65’s rear bench and everything comes coated in leather. A 4.3-inch touchscreen and integrated safe with electrically powered drawer, and heated/ cooled cup holders for the rear passengers are other significant interior upgrades. Brabus is asking a lot of money for this limited edition carbon-clad offroader. Around $800,000 to be exact. Pictured here at the show is the very first Brabus 900 “One of Ten” out of the ten models slated for production.